I spent most of Friday, Saturday and Sunday in Bushwick attending (and participating in -- it was that kind of event) Citydrift, an exhuberant, chaotic, playful, all-embracing art-community undertaking. Among other things, it included night-time scavenger hunts for art, artifacts and about 100 mini-tequila bottles; an art time-capsule (the art was documented and placed in a dumpster, and the whole thing eventually will be buried somewhere); a large golem erected at Momenta Art, brought at night to the nearby Brooklyn Fire Proof cafe/bar/gallery where later that night, with supreme irony, some drunks set it on fire; Lisa Levy's Ego Evaluations (her diagnosis was that I have an inflated view of myself - oy); 4-person ping pong (played crosswise); Barry Duncan palindromes; and many panel discussions. And these are just the events I remember or heard about -- I'm sure I missed a lot. Citydrift is a replicable meta-event qua group installation/art discourse composed loosely in different measures on Guy Debord’s Situationist concept of the derive or drift, Jan Hoet’s 1986 project in Ghent, Chambres D’Amis, and Colin DeLand’s playful reconfiguration of art fair paradigms with his “Gramercy Hotel” model. See what I mean?? But it didn't matter. Everyone just went with it in their own way, which was fitting, and some interesting art, performances, insights and a lot of great schmoozing came out of it. Peter Hopkins, the director of the Bogart Salon gallery, was the "Creator/Director" of the event, and the inexhaustible (and exhausting) driving force. He was greatly aided by the herculean efforts of Meenakshi Thirukode ("Queen Bee") and the interns Maya Meissner and Wilson Duggan. Peter is an important artist in his own right, and this event could be seen as his mad art. He enlisted several Bushwick galleries and what I'd guess was a hundred people, mostly artists, but also art writers, independent curators, and even two long-time East Village and now Chelsea dealers: Magdalena Sawon of Postmasters Gallery, and Wendy Olsoff, of the P.P.O.W. Gallery. The primary activity was “drifts.” On Friday night, groups of people (ten groups by my count -- you can find some information on them here), led by an artist or artists, drifted around Bushwick with some general aim in mind, but open to other things too. The idea was to go with the flow. Saturday the groups met back at Momenta Art or the Bogart Salon, reported on their drifts, and often made some art derived from it. Perhaps the best way to capture what took place is to describe one of the drifts. 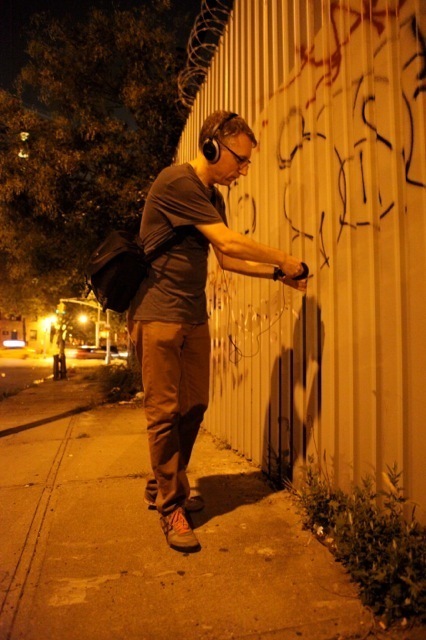 Christopher Williams recording sounds in his drift area (Photo: Jason Das). Working with the Hart Island Project (collaborations were the norm), Chris Williams and Jason Das of the Glass Bees art project and their group explored places in Bushwick where people died who were buried in Hart Island, New York’s enormous potter’s field. They took photos, made sound samples, did drawings, and picked up stuff from the locations. 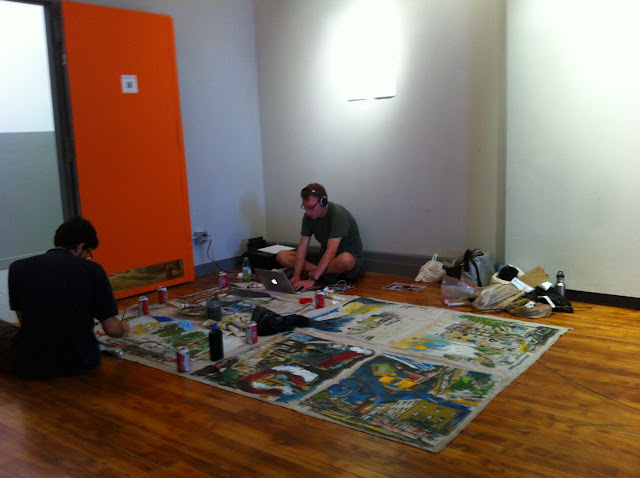 On Saturday and Sunday, Williams and Das created a performance and installation from the drift (see photos below). Jason Das and Christopher Williams in the Bogart Salon working on their Citydrift installation. In addition to all this, on Saturday and Sunday there were four panel discussions mainly about the Bushwick art scene, including one about blogging that I participated in. Unfortunately these panels weren't well attended -- I suspect because people were pretty burned out by then, plus it was difficult to figure out what was happening when. And there were a lot of competing activities. 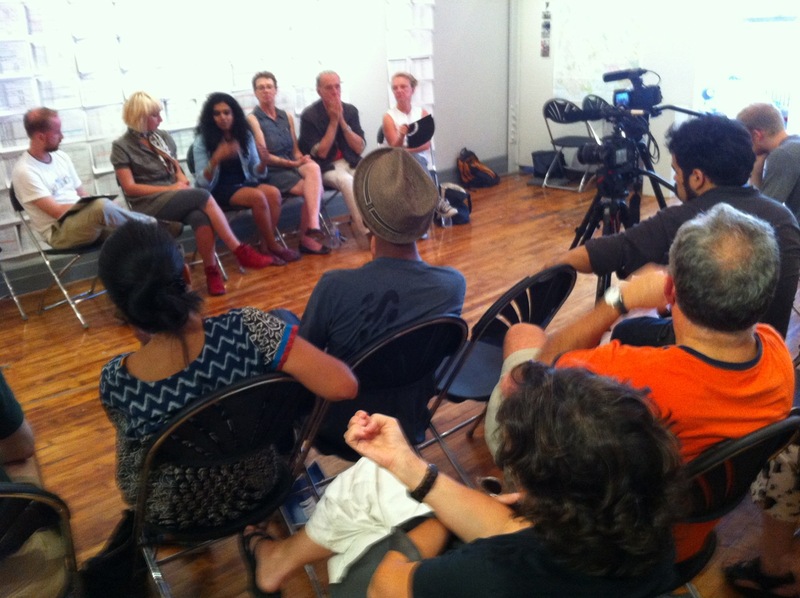 Citydrift panel discussion called Curators in Bushwick: citydrift and The New Model. From L to R: Wilson Duggan, Angela Washko, Meenakshi Thirukode, Melinda Hunt, Stefan Eins and Bonnie Rychlak. You can read their bios here. 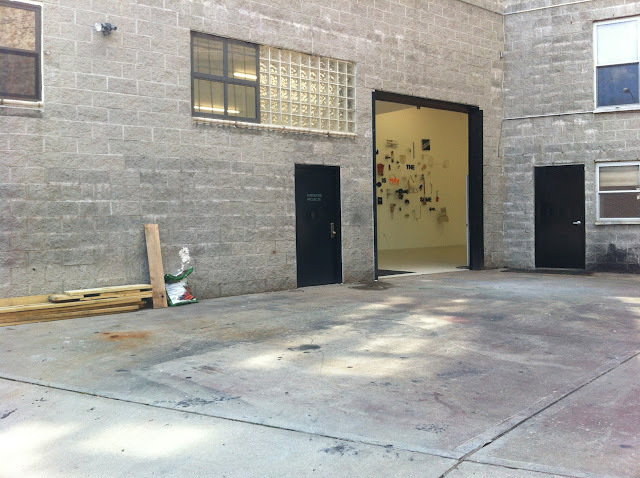 Interstate Projects, view from their courtyard (where they expect to show sculptures and have music and performances). 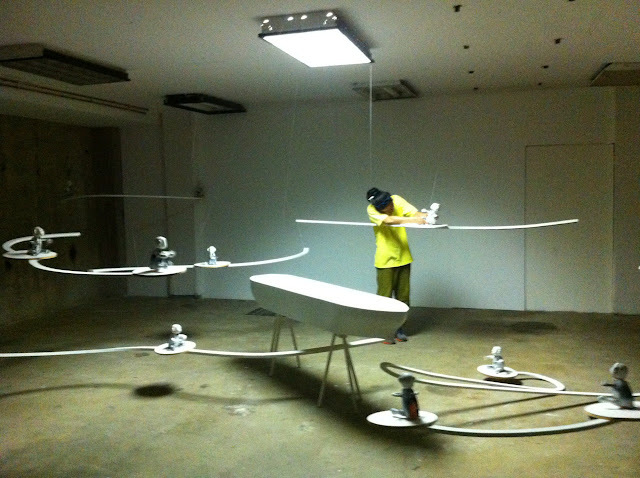 The artist Cheon Pyo Lee working on his sculpture in Interstate Project's basement gallery space. 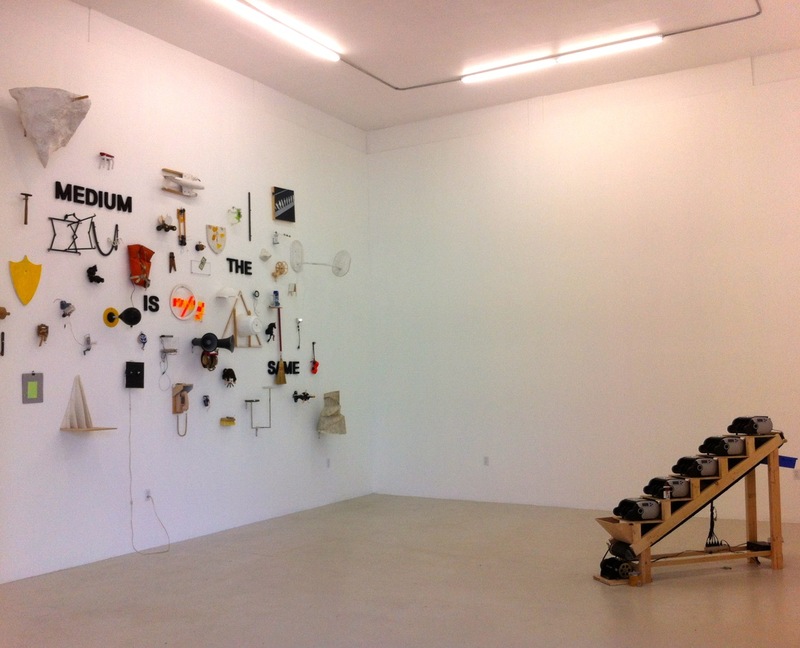 Installation View, Cheon Pyo Lee's exhibition, Medium is the Same. And wait -- there's more! Sunday the Bushwick Starr presented COVERS by Katy Pyle which I saw and loved. 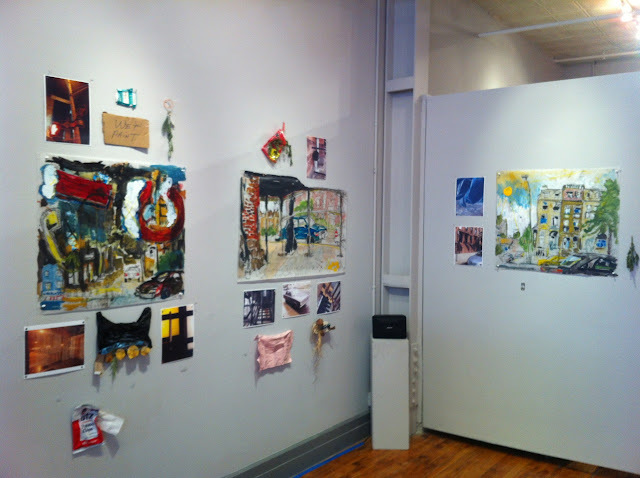 All and all, a pretty full weekend -- even for Bushwick.